Presidential peace adviser Jess Dureza has confirmed to the media that Philippine President Duterte and US President Barack Obama were able to meet at the ASEAN summit. The 'brief' meet took place at a holding room moments before the ASEAN gala dinner commenced. The meeting lasted for about 2 to 3 minutes. BREAKING: Presidential peace adviser Jesus Dureza confirms Duterte and Obama 'briefly talked' at a holding room before proceeding to the ASEAN Gala Dinner. Palace Official: President Rodrigo Duterte was able to speak with the United States' Barack Obama before the ASEAN gala dinner. Department of Foreign Affairs spokesperson Charles Jose bared this information to reporters at the summit in Vientiane, Laos, quoting information from officials with Duterte during the meeting. Duterte and Obama spoke for two to three minutes and were able to "iron out" issues, according to Jose. Meanwhile, United Nations chief Ban Ki Moon and President Duterte were also able to meet. 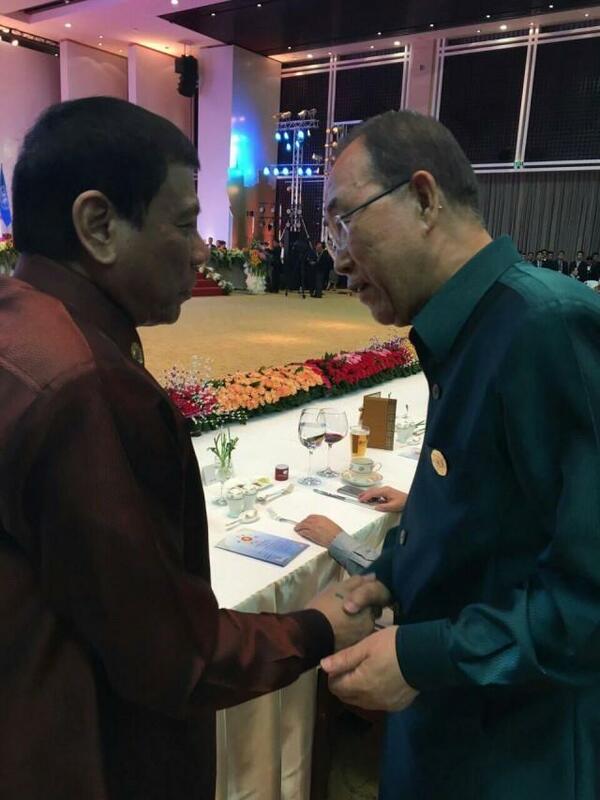 Malacanang released a photo of the two leaders shaking hands during the ASEAN gala dinner. There are no details of the meet yet or as to what the two leaders have talked about.